Sababa Kids is ideal for Jewish children of all backgrounds!! 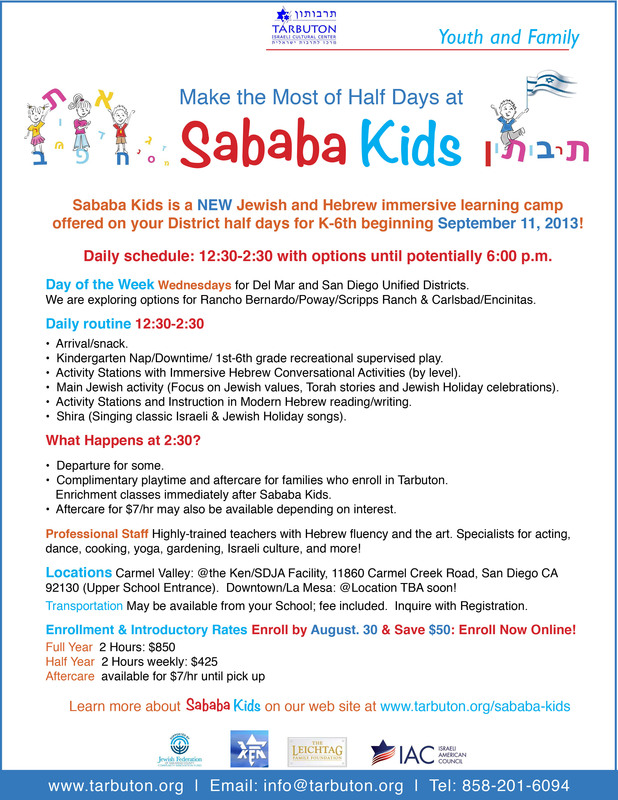 Use the 2 hrs on Half Day Wednesdays for a unique new Modern Hebrew and Jewish and Israel Education “camp like” Learning experience – Sababa Kids. Classes start September 11th and go through June 4th – don’t miss the fun! **Children who can already read and speak Hebrew well, and are in need of Advanced placement, are encouraged to come on Sundays K-4, and Mondays 5th-8th for Modern Hebrew instruction where we offer Hebrew for Levels 4 and 5. Sababa Kids can be a great supplement in addition to other Tarbuton Modern Hebrew classes Advanced Hebrew students, and a great alternative to after care at their public school, but Sababa Kids is not a replacement for enrollment on Sundays or Mondays at Advanced levels.